Intracranial pressure (ICP) is an important clinical variable that remains inaccessible to doctors and aerospace professionals. Ten Pilots of the Brazilian Air Force Academy (AFA) were monitored with a Brain care Non-Invasive Intracranial Pressure Sensor during looping maneuvers. The intracranial pressure sensor used was the model BcSs-1000, developed by the Brain care team. The pilot performed the flight in the T-25 Aircraft used in the aviator training course at the Brazilian Air Force Academy (AFA).The ICP of the volunteers was monitored on the occipital bone using a sensor attached to the pilots’ helmets. The ICP measuring device was attached to a bag and fixed to the pilot. The monitoring was carried out during a 30minute flight. Pilots were instructed to perform one acrobatic looping with an average duration of 30seconds. The stunts were performed in the fifteen minutes of the flight. The maximum Gz load of these acrobatic maneuvers was measured as +3 Gz. It was observed in the results that during the execution of the looping acrobatics, there was an increase in the values of area, height and amplitude of the ICP peaks. The results showed that there was an increase of approximately 46.25% of the peak of ICP after the beginning of the looping. When compared to the ICP during the looping, the values found were 55% lower. By observing all the results, human exposure to Load Gz raises the values of the ICP and can have the consequence of an increase in arterial pressure. These professionals can be submitted to extreme physiological conditions, and, consequently, lack of physical preparation or clear perception of some symptoms can lead to physical failure, even death.7,8 Although technological developments have provided advances in ergonomic designs, software, hardware, and air traffic control techniques-which has had a positive impact on flight safety-the presence of the human factor remains a prominent cause of aeronautical accidents.9–11 Space disorientation is a significant factor in a large percentage of military aviation incidents. While previous studies have analyzed accident statistics, they often suffer from methodological flaws, leading to questionable conclusions about the true causes of accidents with civilian and military aircraft.12,13 Acrobatic flight can significantly alter a pilot's ability to orient themselves spatially. In this way, factors inherent to the human physiology associated with aerial activity should be investigated; intracranial pressure (ICP) is an important clinical variable that remains inaccessible to doctors and aerospace professionals. ICP is the pressure inside the cranial cavity. Three components fill this space: blood, cerebrospinal fluid, and brain tissue, and alterations in one or more of these components leads to variations in intracranial pressure,14 such as oscillations in arterial blood pressure. Exposure to high Gz acceleration can lead to changes in blood pressure and redistribution of blood volume. The Gz load is classified into two types: the Gz load is positive when the aircraft moves in the opposite direction to the component of the gravity force and acceleration is greater than that of gravity (9.8m/s2); and the Gz load is negative when the aircraft is in inverted flight (back flight), or its direction is the same as the gravity force, but with acceleration greater than gravity. The cardiovascular alterations in positive or negative Gz result from an increase in the hydrostatic gradient present in the venous and arterial systems.15,16 Positive Gz increases cerebral blood flow, while negative Gz directs blood flow to the lower limbs. The high positive Gz forces found in tactical military aviation and acrobatic flights produce a series of physiological responses designed to preserve cerebral perfusion. Some air forces have instituted measures through anti-Gz suits to increase the physiological response in order to avoid G-induced (G-LOC) loss of consciousness and the potentiality to cause a catastrophic accident.17 High GZ acceleration effects can threaten flight safety through loss of consciousness or a lesser known phenomenon, G-induced vestibular dysfunction (GIVD). There are reports of GIVD after high-speed exposure or exposure to the centrifuge.13,18 Exposure to high accelerating +Gz forces in a centrifuge or aircraft can severely decrease cerebral blood perfusion and cause rapid G-induced loss of consciousness.1,18 However, smoother acceleration can gradually reduce cerebral blood flow and affect cognitive function.1 This study used intracranial pressure monitored noninvasively to understand the effects of Gz alterations on cerebral hemodynamic and intracranial pressure. Ten Pilots of the Brazilian Air Force Academy (AFA) were monitored with a Brain care Non-Invasive Intracranial Pressure Sensor during looping maneuvers. The pilots performed the flight in a T-25 Aircraft used in the aviator training course at the Brazilian Air Force Academy (AFA). The ICP of the volunteers was monitored on the occipital bone using a sensor attached to the pilots’ helmets. A Brain care Monitor BcMM-2000 (Brain care Health Technology) was used to monitor and record data with a sampling rate of 200Hz. The intracranial pressure sensor used was the model BcSs-1000, developed by the Brain care team. The ICP sensor was attached to a bag and fixed to the pilot. The monitoring was carried out during a 30 minute flight. Pilots were instructed to perform one acrobatics Loopings with an average duration of 30 seconds. The stunts were performed in the fifteenth minutes of the flight (Figure 1). The maximum Gz load of these acrobatic maneuvers was measured as +3 Gz. Data were collected in an SD card and analyzed off line. Figure 1 Effects of P sources and application rates on residual total N in soils after harvest. We calculate the mean pulse properties - height, area, peaks positions, time to peak, length and inflection points-by local search of numerical maxima and minima on pulse waveform and its derivatives. 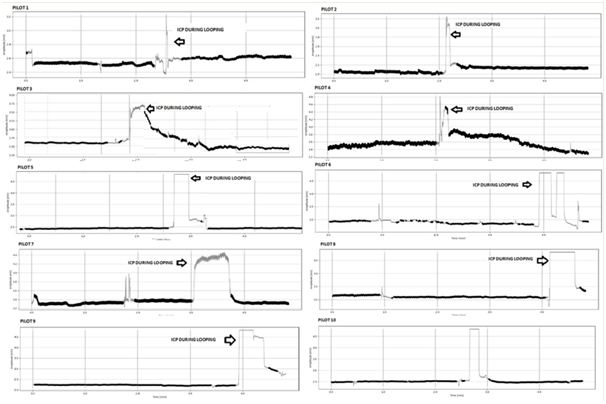 Statistical inference on pulse properties was done using nonparametric statistical tests.22 All safety standards were adhered to in the study. All subjects were experienced with exposure to high Gz+. The National Ethics Committee approved the project (CAAE: 40667114.7.0000.5504), and financial support was received from the São Paulo Research Foundation (FAPESP-Process no. 2014/21803-7). The results are presented in figures. The total area of the curve, the height and amplitude of the ICP peak, and the total time of the pulses in seconds were measured. Blood volume mean per cardiac pulse was indirectly estimated. The height of the peak determined the maximum variation in blood volume during each heartbeat. It is known that total peak time is inversely proportional to the resistance of the cerebral vascular system, i.e., the longer the total pulse time, the lower the cerebral vascular resistance.23 It was observed in the results that during the execution of the looping acrobatics, there was an increase in the area, height, and amplitude values of the ICP peaks (Figure 2). 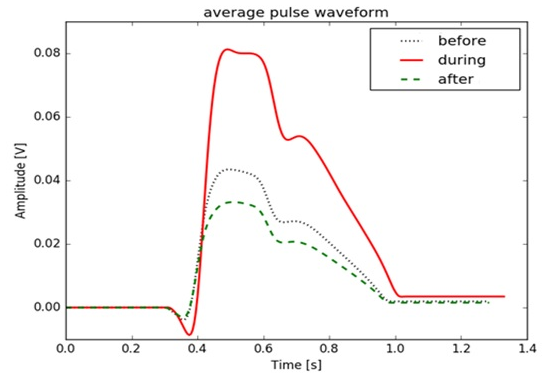 It was observed that in 70% of the samples a decrease in the IPC pulses occurred after the looping when compared to the same values before the looping (Figure 3). The total decrease in the area was small, only 1.71%. The heart rate of the pilots decreased 1.67% in this comparison. It is important to highlight in the above results that in all cases there was an increase in ICP during looping. 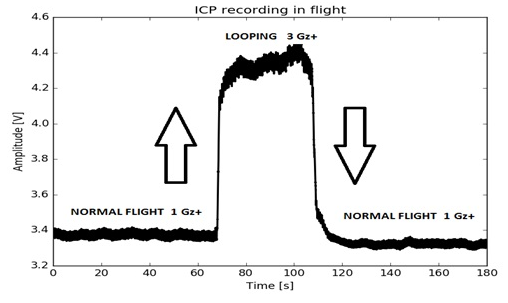 In order to discard the hypothesis that this increase was due to the movement of the pilot's head during the looping, we performed tests that verified that the change in head direction did not influence the results of the increase in ICP. Figure 2 Effects of P sources and application rates on residual total N in soils after harvest. Figure 3 Effects of P sources and application rates on residual total N in soils after harvest. Although this is a broadly speculated theme, largely theoretical, intracranial hypertension induced by flight with Gz gravitational variation has gained acceptance as a distinct clinical phenomenon, yet the underlying physiological mechanisms are still poorly understood. Symptoms of malaise, nausea, vomiting, vertigo, headaches, and visual pathologies and disturbance are commonly associated with an increase in ICP, both on land and in flight.27,28 The most likely mechanisms of ICP include cephalic displacement of body fluids, obstruction of venous flow, largely induced by increased Gz, and which may result in increased Arterial and Intracranial Pressure.30,31 The great difficulty for researchers is the realization of an experiment in flight. The major Aerospace Medicine centers carry out experiments with variation in Gz load in human centrifuges. The present study, however, sought new information in flight associating non-invasive equipment to measure the ICP, with variations in the Gz load.9,30,31 The difficulties in carrying out this experiment were great, among them adapting the sensor to the helmet and carrying out the collections in flight. Another difficulty was recording the data without electromagnetic influence of the aircraft, all this in association with flight safety of the evaluated pilot. The partnership between the researchers and the Brazilian Air Force was fundamental to the success of the project. In this way, a considerable amount of time was spent so that the collections would present real data and with credibility to our research. Long-term exposure to an increase or absence of gravity has aroused the concern of the aerospace medical community as its effects on the nervous system are unknown.32 One of the objectives of this experiment was to establish whether there is an increase in blood flow to the brain and as a consequence an increase in ICP during human exposure to an increase in Gz. There is evidence in the results of this work that corroborate with this objective. Figure 4 Effects of P sources and application rates on residual total N in soils after harvest. Figure 5 Effects of P sources and application rates on residual total N in soils after harvest. Figure 6 Effects of P sources and application rates on residual total N in soils after harvest. Variation in intracranial pressure is a very common event, and may even occur in the case of simple encephalitis, or severe cases that require deep and appropriate knowledge for monitoring and subsequent treatment. It is necessary that the medical profession at least dominate and understand ICP. The techniques described in this work to obtain an intracranial pressure signal in flight required knowledge from the evaluators. Currently the techniques for non-invasive ICP monitoring are still under study. From the moment the signal is obtained, it is possible to draw conclusions about other vital parameters such as heart and respiratory rate, through adequate filtration and processing of the signal received. Thus, it is possible to save time and resources that may be essential in diagnosis. For future studies we suggest the analysis of blood pressure continuously together with ICP (Prx), and measurement of rSO2. Our team of researchers is already developing equipment that performs the monitoring of multiple parameters simultaneously, allowing reaction to a crisis situation and the creation of a strategy for the care of the evaluated individual. This study verified that an increase in ICP occurs due to acrobatic flight with variation in Gz. The literature is still scarce on the problem of cranial hypertension in the real space flight environment, and further studies are needed if this phenomenon is to be properly understood. Participated in the collect of samples: TARB. Conceived and designed the experiments: TARB, GF, DLSJ and SMO. Analyzed the data: DLSJ. Wrote the paper: TARB, DLSJ, GF. Sevilla NL, Gardner JW. G-induced loss of consciousness: case-control study of 78 G-Locs in the F-15, F-16, and A-10. Aviat Space Environ Med. 2005;76(4):370–374. Wilson GF, Reis GA, Tripp LD. EEG correlates of G-induced loss of consciousness. Aviat Space Environ Med. 2005;76(1):19–27. Maurino DE. Beyond aviation human factors: safety in high technology systems. UK: Ashgate Publishing Company; 1997. 181 p.
Galvagno SM, Massa TV, Price SC. Acceleration risk in student fighter pilots: preliminary analysis of a management program. Aviat Space Environ Med. 2004;75(12):1077–1080. Hargens AR, Richardson S. Cardiovascular adaptations, fluid shifts, and countermeasures related to space flight. Respir Physiol Neurobiol. 2009;169(Suppl 1):S30–S33. Gopalakrishnan R, Genc KO, Rice AJ, et al. Muscle volume, strength, endurance, and exercise loads during 6-month missions in space. Aviat Space Environ Med. 2010;81(2):91–102. Schlegel TT, Wood SJ, Brown TE, et al. Effect of 30-min +3 Gz centrifugation on vestibular and autonomic cardiovascular function. Aviat Space Environ Med. 2003;74(7):717–724. Chen HH, Wu YC, Kuo MD. An electromyographic assessment of the anti-G straining maneuver. Aviat Space Environ Med. 2004;75(2):162–167. Albery WB. Acceleration in other axes affects +Gz tolerance: dynamic centrifuge simulation of agile flight. Aviat Space Environ Med. 2004;75(1):1–6. Hargens AR, Bhattacharya R, Schneider SM. Space physiology VI: exercise, artificial gravity, and countermeasure development for prolonged space flight. Eur J Appl Physiol. 2013;113(9):2183–2192. Arbeille P, Provost R, Zuj K, et al. Measurements of jugular, portal, femoral, and calf vein cross-sectional area for the assessment of venous blood redistribution with long duration spaceflight (Vessel Imaging Experiment). Eur J Appl Physiol. 2015;115(10):2099–2106. Macias BR, Liu JHK, Grande-Gutierrez N, et al. Intraocular and Intracranial Pressures During Head-Down Tilt with Lower Body Negative Pressure. Aviat Space Environ Med. 2015;86(1):3–7. Jia H, Cui G, Xie S, et al. Vestibular function in military pilots before and after 10 s at +9 Gz on a centrifuge. Aviat Space Environ Med. 2009;80(1):20–23. Mori E, Ishikawa M, Kato T, et al. Guidelines for management of idiopathic normal pressure hydrocephalus: second edition. Neurol Med Chir (Tokyo). 2012;52(11):775–809. Knudson R, McMillan D, Doucette D, et al. A comparative study of G-induced neck injury in pilots of the F/A-18, A-7, and A-4. Aviat Space Environ Med. 1988;59(8):758–760. Barker PD. Reduced G tolerance associated with supplement use. Aviat Space Environ Med. 2011;82(2):140–143. Watenpaugh DE, Smith ML. Human cardiovascular acclimation to microgravity. J Gravit Physiol. 1998;5(1):15–18. Han WQ, Hu WD, Dong MQ, et al. Cerebral hemodynamics and brain functional activity during lower body negative pressure. Aviat Space Environ Med. 2009;80(8):698–702. Oppenheim AV, Schafer RW, Buck JR. Discrete Time Signal Processing. London: Pearson; 1999. 870 p.
Benitez D, Gaydecki PA, Zaidi A, et al. The use of the Hilbert transform in ECG signal analysis. Comput Biol Med. 2001;31(5):399–406. Hastie T, Tibshirani R, Friedman J. The Elements of Statistical Learning. Elements. 2009;1:337–387. Gibbons JD, Chakraborti S. Nonparametric Statistical Inference. New York: Marcel Dekker; 2003. 672 p.
Wiener TC. Space obstructive syndrome: Intracranial hypertension, intraocular pressure, and papilledema in space. Aviat Space Environ Med. 2012;83(1):64–66. Yuh EL, Dillon WP. Intracranial hypotension and intracranial hypertension. Neuroimaging Clin N Am. 2010;20(4):597–617. Alexander DJ, Gibson CR, Hamilton DR, et al. Risk of Spaceflight-Induced Intracranial Hypertension and Vision Alterations. USA: Nasa; 2012. 109 p.
Tripp LD, Warm JS, Matthews G, et al. +Gz acceleration loss of consciousness: Time course of performance deficits with repeated experience. Hum Factors. 2006;48(1):109–120. Schrouff J, Perlbarg V, Boly M, et al. Brain functional integration decreases during propofol-induced loss of consciousness. Neuroimage. 2011;57(1):198–205. Aponte VM, Finch DS, Klaus DM. Considerations for non-invasive in-flight monitoring of astronaut immune status with potential use of MEMS and NEMS devices. Life Sci. 2006;79(14):1317–1333. Melek WW, Lu Z, Kapps A, et al. Modeling of dynamic cardiovascular responses during G-transition-induced orthostatic stress in pitch and roll rotations. IEEE Trans Biomed Eng. 2002;49(12 Pt 12):1481–1490. Heldt T, Shim EB, Kamm RD, et al. Computational modeling of cardiovascular response to orthostatic stress. J Appl Physiol. 2002;92(3):1239–1254. Carpenter MG, Allum JH, Honegger F. Vestibular influences on human postural control in combinations of pitch and roll planes reveal differences in spatiotemporal processing. Exp Brain Res. 2001;140(1):95–111. Michael AP, Marshall-Bowman K. Spaceflight-Induced Intracranial Hypertension. Aerosp Med Hum Perform. 2015;86(6):557–562. Newman DG, Callister R. Cardiovascular training effects in fighter pilots induced by occupational high G exposure. Aviat Space Environ Med. 2008;79(8):774–778. Stevenson AT, Scott JPR. +Gz Tolerance, with and without muscle tensing, following loss of anti-g trouser pressure. Aviat Space Environ Med. 2014;85(4):426–432. Whinnery JE. +G(z) tolerance correlation with clinical parameters. Aviat Space Environ Med. 1979; p. 736–741. Kikukawa A, Tachibana S, Yagura S. G-related musculoskeletal spine symptoms in Japan Air Self Defense Force F-15 pilots. Aviat Space Environ Med. 1995;66(3):269–272. Steiner LA, Coles JP, Czosnyka M, et al. Cerebrovascular pressure reactivity is related to global cerebral oxygen metabolism after head injury. J Neurol Neurosurg Psychiatry. 2003;74(6):765–770. Yates BJ, Kerman IA. Post-spaceflight orthostatic intolerance: Possible relationship to microgravity-induced plasticity in the vestibular system. Brain Res Rev. 1998;28(1-2):73–82. ©2018 Bezerra et al. This is an open access article distributed under the terms of the Creative Commons Attribution License , which permits unrestricted use, distribution, and build upon your work non-commercially.